The 12 Day Power Detox Program is an intensive 12 Day Nutrition and Wellness Program which was created by divine inspiration, JUST FOR YOU! The Nutrition part of the program comprises of a 12 Day green smoothie meal plan which will help you detox your body and the Wellness part comprises of a 12 Day Devotional which will help you detox negative emotions from your soul. This bring a holistic approach to this program. The 12 Day Power book includes Grocery List, Delicious Recipes, the Meal & Activity Plan, Devotional Reading etc. ), and access to Private Facebook Support Group. Our detox smoothie recipes are full of vitamins, antioxidants, fiber, and other healthful nutrients giving your body a detoxifying cleanse. They also contain large amounts of water, which helps to hydrate your body and boost metabolism. I especially like that fact that you can get your daily dose of vitamins, minerals and other nutrients just in one cup of smoothie. People may not necessarily be open to trying a salad but are generally open to trying a cold cup of refreshing goodness. Cleanse your body: Over time there is a buildup of harmful toxins i.e. preservatives, pesticides, heavy metals such as mercury and lead in the body through the consumption of the food we eat and exposure to pollution. This can affect our metabolism, behavior, immune system, and leads to disease. Our detox program is designed to stimulate the body to cleanse itself, helping the liver, kidneys and colon do what they naturally do which is getting rid of toxins and waste from the body. Reduce the risk of serious diseases: It is well known that one way of preventing cancer and heart disease is to increase the number of fruit and vegetables in your diet. The more green smoothies you drink, the lower your risk. Look Younger: The increased fluids and power of natural foods in your diet will hydrate your skin and reduce your wrinkles making you look younger. Feel Energized: Fruits are a good source of energy, but eaten alone will only provide short bursts of energy (they contain lots of sugars, which are quickly metabolized). Because of their high content of veggies, green smoothies have balanced sugar content. Weight Loss: Increasing the number of fruit and vegetables you eat in a day gives your body an opportunity to shed excess fat and water weight built up from toxins stored in the body. Our green smoothies are low in calories but very filling. Because they contain high amounts of water and fiber, they’ll make you feel as if you just ate a full meal. If you’re trying to lose weight and belly fat, our green smoothies contain a combination of fruits and vegetables that will help fight hunger, reduce cravings and bloating while helping the pounds melt off easier. Even though this is not a weightloss program, participants who completed this program and reported their weight loss have lost 7lbs to 10lbs in 12 days. Crave less junk: When you increase the amount of healthy foods in your diet and decrease the unhealthy foods you will naturally stop craving junk food and crave more of the same healthy food. You will begin the lifestyle of eating healthier even after the Detox Program. Detox Negativity and Negative Emotions: Rejuvenate your mind and spirit by detoxing negative emotions with daily inspirational devotional. Negative emotions include anger, unforgiveness (offense), stress/worry/anxiety/fear, jealousy, pride, addiction, disappointment/failure; judgement/condemnation; betrayal, rejection/abandonment, Harsh/cursewords/hate, etc. This devotional will be send to you daily via email. Daniel Fast: This is one of the types of fasting based on how Daniel fasted in the bible. During the Daniel Fast, you do not eat meat, diary, sweets, fried food and bread. The only drink allowed is water. So you get to try a variety of specified fruits, nuts, grains and vegetables. The smoothie recipes provided in our 12 Day Power Detox Program can be used as a part of the Daniel Fast. WHAT’S IN YOUR SMOOTHIE CUP? Water: Water is essential for the proper functioning of the body and circulation of nutrients in the body. It aids digestion of food i.e. breaking down food so that your body can absorb the nutrients. Water flushes the liver tissues, aiding in removing toxins, and assists the kidneys during detoxing, so the liver can focus on its own cleansing. Vegetables: They are a good source of many nutrients, including iron, potassium, fiber, folate (folic acid) and vitamins. Fruits: Fruits are important sources of many nutrients, including potassium, fiber, vitamin C and folate (folic acid). Fruits compose of antioxidants which help the body fight diseases and cancers. Plant based protein and healthy fats: Nuts are a good source of fiber, heart-healthy fats, and provide a wide range of essential nutrients, including protein, vitamins and minerals such as calcium, iron, zinc, potassium, magnesium, and antioxidants. I had an amazing experience during the 12 Day Power Detox Program. I never thought I could do it until I actually started. It was really helpful in forming healthy habits and I felt good emotionally and spiritually at the end. I lost 15 pounds by the end of the program. It’s been a year now and I have only gained 5 pounds back since the program. ​Thanks Ade for introducing me to the 12 Day Power Detox. By Day 11, I had lost 8 lbs.....Woohoo!. My belly fat had melted off and my clothes fit better. It has really help me shed off some of the weight I gained when I had my last baby. I felt clean on the inside. Overall, I felt lighter, my skin looked fresher, had more energy, better bowel movement and rest at night. I'm sharing this good news with my friends and family. Thanks again. ​I was excited to find out about the 12 Day Power Detox because it was an answered prayer. The first thing I noticed after Day 2 was more regularity in my bowel movements. My body felt a lot lighter and l started sleeping longer hours at night. After Day 7, I checked my weight and I was down 4lbs. I became more energetic. Even though this is not a weight loss program, I lost a total of 7lbs. and 3 inches off my waist. I am usually not quite a fan of "detox" I generally believed it was a glorified diet but I had amazing energy by Day 3. I didn't need coffee to be awake nor maintain stamina. I began to lose weight immediately. I actually lost a total of 12 lbs. and everyone around me was astonished! My skin was clear and makeup went on very smoothly. Don't like green smoothies? Hear what this converted “smoothie lover” has to say. When Ade told me about this program, my initial reaction, as a physician was “I don’t do detox”. I also did not like smoothies. But I am now a converted “smoothie lover” and I have incorporated these smoothie recipes into my diet, especially for breakfast. What I like most about the detox program is that it is designed to benefit the whole you - “spirit, soul and body”. Weight loss is just an added benefit. I lost a little over 12 pounds and 2 inches off my bust, waist and hips. I am more mindful about food overall, and am proud to have lost 8 lbs. in all! I lost 3 inches in my waist. The devotionals helped me focus on the intent of my participating, and were often right on time for the things I was facing during the detox. Did I hear you say all these results in 12 Days? The answer is Yes! This could be you. I'm inviting you to take advantage of this special invitation. Sign up now! I'm looking forward to hearing your results. ​Why should I detox my Spirit, Soul and Body? EVERYONE needs to detox. You breathe polluted air, you experience stress—both of which have physical byproducts in the body—and nobody’s diet is “perfect.” If you can answer this question honestly and your answer is a “Yes”, then you probably don’t need to do a detox. Are you willing to guarantee that you eat a healthy diet that is void of processed foods, genetically modified foods, caffeine, food coloring, refined sugars, alcohol or pesticides? Think of your body as a vehicle requiring regular maintenance oil change. Routine oil and filter changes help remove particles and sludge and keep engines at peak condition. Buildup from dirty oil robs a vehicle’s fuel economy and power, and makes internal components work harder. An engine that works too hard will end up having more problems down the road as well as a shorter life span. The organs of your body works like the engine of a vehicle. Regular maintenance and detox are necessary to keep your body in good health thereby prolonging your life. As you may know man is a 3 part being with a spirit, soul and body. Your soul is the dimension of man which deals with the mental realm. It consists of his mind, will and emotions. It’s the part that reasons and thinks. The emotions are the responses (feelings) about the information which comes to us – from the physical world around us and from the spirit within us. We respond to emotions by crying, or feel like crying over news that we hear with our ears, but we can also cry when, from our spirit, we become aware of how much God loves us. The soul has not only the memory of things in your life which have happened but the way you felt about those things (your emotions). The 12 Day Power Detox Devotional will guide to through the process of detoxing negative emotions you’ve experienced while embracing positive emotions. You would begin to feel happier, free to love and trust again. I'm skeptical about adding green vegetables to my smoothies, what do you recommend? How this program different from any other detox or cleanse program? 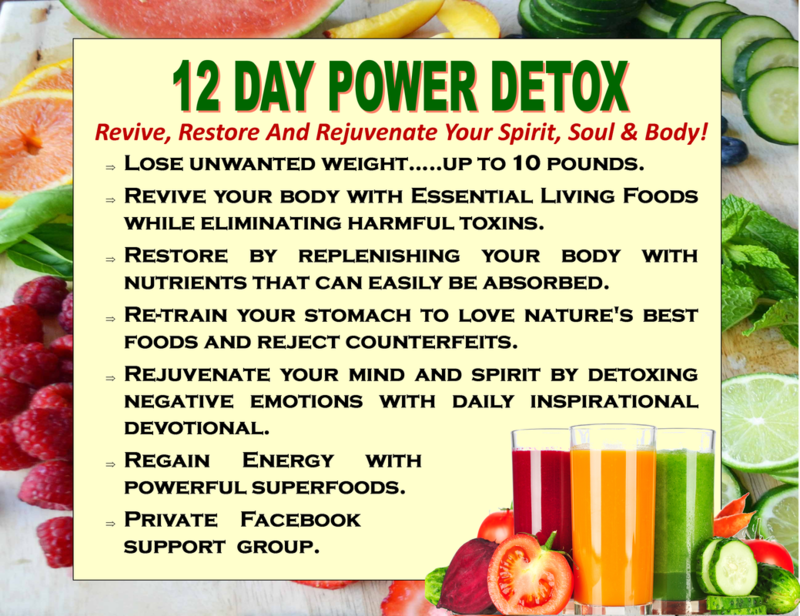 The 12 Day Power Detox Program offers a holistic approach to detoxing. It has the Nutrition and Wellness components which will help you Revive, Restore and Rejuvenate Your Spirit, Soul & Body. Variety is the spice of life. Over the next 12 days, you get to try different kinds of fruits, nuts and vegetables which will super charge your body. This detox program is valued at over $250 but it available to you at an affordable promotional price. All you have to do is register to begin to experience your results. How do I set myself up for a successful completion? To have a successful completion, you need to follow recipe instructions, be disciplined, determined, have support and accountability. If this is your first time doing a vegetarian meal plan, it is okay to start with the Modified 12 Day Power Detox Program. Read the Important Notes Section. Complete the action items listed in the Prep Week. Pack the daily recipe food items and snacks in freezer bags for the first 6 days during the Prep Week. Print out the 12 Day Power Detox Meal Plan and put it in a visible part of your home or office as a reminder throughout the day. How do I get accountability and support to keep me going on this Program? After registration at www.itstimefitnessaz.com, you would receive the link to join the Private Facebook Support Group. This is where you would get the support and accountability you need from Coach Ade and other participants to cheer you on to the finish line. I'm worried about losing any more weight but I still want to try the Detox Program, what should I do? Do the Modified Detox Program. Eat vegetarian salad or soup for lunch and smoothies for breakfast and dinner. What should I do if I feel hungry during the Detox? During this program, you shouldn’t be hungry if you follow the meal plans for Week 1 and 2. When you feel hungry, eat one serving of the recommended healthy snacks between smoothie meals. One serving of raw nuts is about a handful. One serving of carrots is 1 cup. Make sure you are drinking 64 ounces of water daily and sipping your Detox Tea as well. This program is too much of a challenge, I feel like quitting? Before you throw in the towel, switch to the Modified Detox for as long as you can. The food cravings will always show up i.e. the temptations at work, home or at a get together. If you slip and ate something outside of what’s recommended on this Detox Program, the decision to continue depends on you. You can pick up the next day or choose to start over at another time. Your results will vary from participants who followed the meal plan and completed the Detox Program. How long can I stay on the 12 Day Power Detox? If you are going to keep drinking the smoothie recipes as part of your regular healthy diet, rotate your greens; try a variety of green vegetables in your smoothie. We recommend that you do not stay on the 12 Day Power Detox program longer than 2 weeks at a time. You can plan to repeat it periodically i.e. every 3 months. What should I do if I experience any of the following? Headaches: Headaches are the one of the common side effect of detox programs. This usually happens within the first few days of the detox, especially for first timers. Sudden withdrawal from caffeine or sugar can have this effect, as can dehydration. I don’t recommend pain relief medications during the detox. The most effective treatment for headaches during a detox is still to drink plenty of water and get some rest. Cravings or Hunger Pangs: You may experience hunger pangs the first few days of the detox but it will eventually stop after a few days as the body successfully acclimates. Over time, the green smoothies will help you eliminate cravings but you may have craving for different food items initially. Here are a few tips to overcome your cravings or hunger pangs: drink a bottle of water or detox tea; go for a walk or have a nap; eat a handful of nuts or your favorite vegetable; change the focus by doing your favorite activity or exercise. During the Detox, sometimes I feel like chewing on something, so I would grab one serving of baby carrots and drink water. This really helps! Constipation/Diarrhea: Participants who follow the recipes and instructions typically do not experience these symptoms but there could be exceptions. Green smoothies are high in fiber so digestion should improve. Once your body adjusts to the increase in healthy food and fiber, the symptoms will subside – usually within a couple days. Constipation may be due to the sudden increase of fiber in the diet. Check your water intake. If you haven’t had the specified amount i.e. 64 ounces, drink up. Also make sure you are following the measurements on the recipes. The Salt Water Cleanse is also a good way to get rid of constipation if the other suggested methods fail. See the Important Notes Section. Breakouts: Your skin is the largest detox organ and it helps your body release toxins through your pores in the form of sweat. If you experience breakouts, it’s probably because of the detox and it should clear up in a few days. If any of the above symptoms persist beyond a week, then they may signal a necessary change that you need to make. Please stop the detox program and consult your doctor.